The first round of Ukraine’s presidential elections will take place in 10 days time. We have prepared a “survival guide” for you: here are 10 key things to know facing the first round. Volodymyr Zelenskiy, a Ukrainian comedian, leads in all opinion polls with a lead of 5 to 10 percentage points. 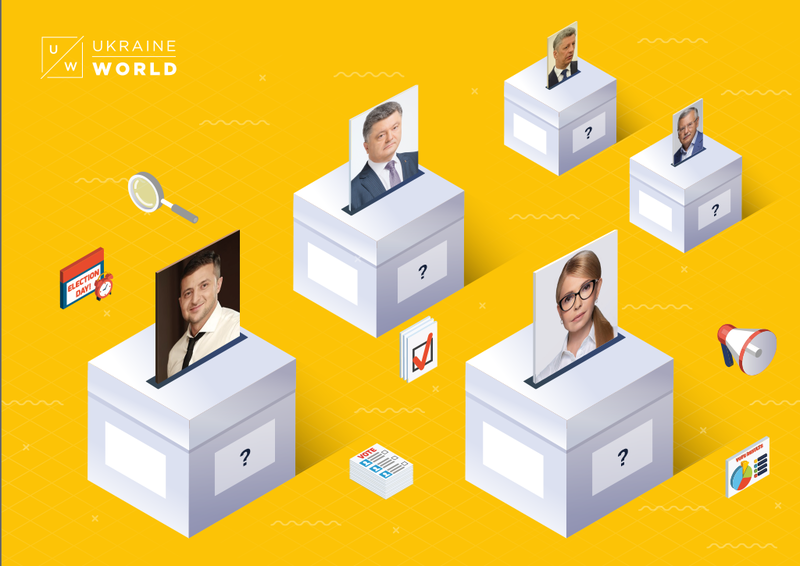 Yulia Tymoshenko, the head of the Batkivshchyna party, and Petro Poroshenko , the current President, are fighting for second place. The ratings of the Top-3 candidates have been consistent since the beginning of 2019. Zelenskiy offers a new type of populism. He hardly promises anything, but instead shows how "cool" he is. At the same time, he is allegedly controlled by Ihor Kolomoyskyi, a Ukrainian oligarch, which limits his room for manoeuvre. As in every functional democratic election, the final result is unpredictable. The behavior of the teams of the key candidatesshows that they are not sure who will win. For the first time since 2004, it is not even clear who will make it to the second round. The pluralism of the candidates running ensures checks and balances. If someone wants to rig the results or buy votes, other candidates will shine the light on this. Thus, messages about the "falsification" or "buying" of votes are media fakes aimed to put the blame on opponents or to de-legitimize the election as a whole. "Technical" candidates historically play a huge role in Ukrainian elections. They are meant to draw voters from their opponents while ensuring better positions of major candidates in local election commissions. The largest number of female candidates registered for 2019 elections since Ukraine gained independence — 4 out of 44. However, none of them call for gender equality are fighting sexism. All top-3 candidates support Ukraine's NATO integration. At the same time, there is no dramatic split between pro-Western and pro-Russian forces, which used to define Ukraine's elections in the 1990s and 2000s. Ukraine is a mixed republic leaning to a bigger role played by the country's Parliament. Thus, the parliamentary elections scheduled to take place in October 2019 will be even more important, as the President of Ukraine cannot do much without the support of Parliament. All the major candidates have their own political parties. Russia tries to influence Ukrainian elections by setting up and supporting "alternative media," especially TV channels, to put across an anti-Western agenda and create a general image that the vote will be rigged. These moves are part of Russia's information war against Ukraine and the West. Ukrainian elections are quite important in both the global and European context. On the one hand, there is the question as to whether Ukraine will be able to continue its pro-Western reforms when other countries f the Eastern Partnership (Moldova, Georgia) are rolling them back. On the other hand, Ukraine is surrounded by autocracies (Russia, Turkey, Belarus) and countries where conservative or pro-Russian rollback has taken place (Hungary, Poland, Czech Republic). The elections will also define whether the general consensus with regard to Donbas, Russia will change.